The opening scene to 1964’s Goldfinger, one of the most popular and critically-acclaimed James Bond movies, portrays the famous spy at his deadliest and most suave. Bond emerges from the ocean in diving gear, takes out a guard, plants some explosives – and then rips off his wetsuit to reveal that he’s wearing a spotless (and totally dry) tuxedo underneath. He then casually makes his way into a bar to await the explosion he’s set up. It’s a brilliant scene, but so outlandish that it takes a good degree of suspension of disbelief to keep a straight face. It was even parodied in the Austin Powers movies.However, regardless of how unbelievable this movie scene may appear, a scene exactly like this really did play out in WW2. The spy in question was Peter Tazelaar. 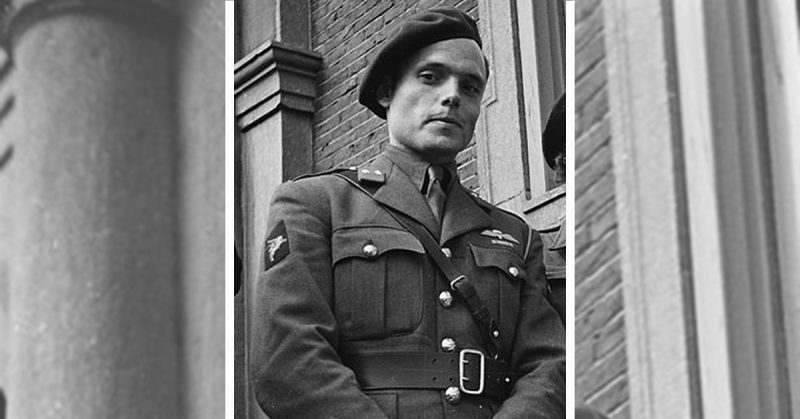 He was a real-life James Bond working for the exiled Dutch government and assisted by the British Secret service. 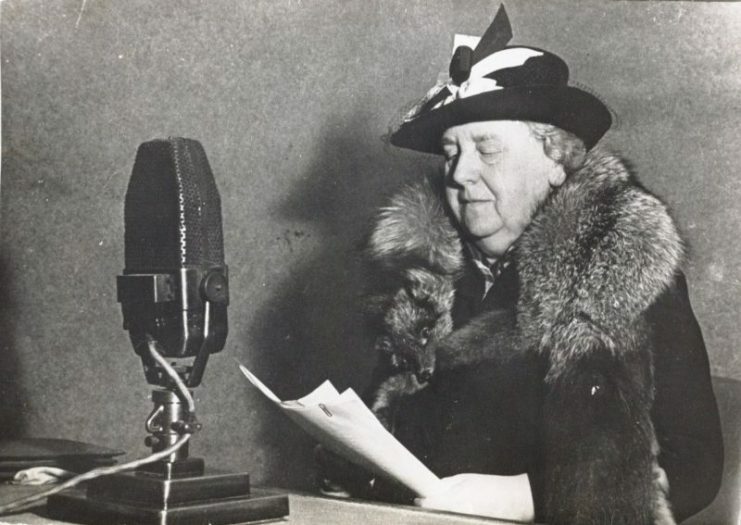 Visit of Queen Wilhelmina and Princess Juliana to Breda in 1945. First on the left is Peter Tazelaar. 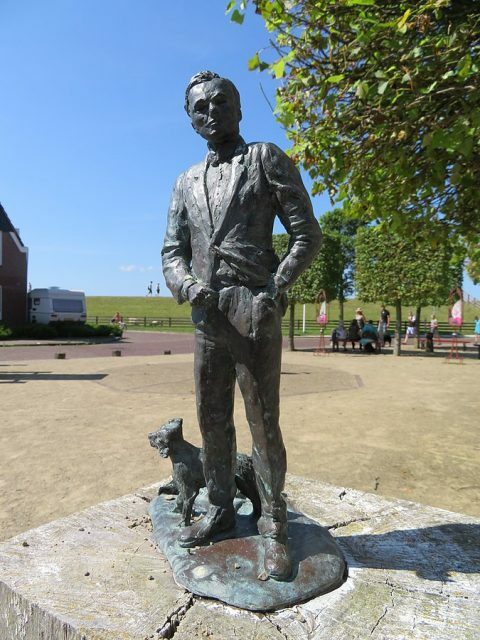 His mission, codenamed Contact Holland, was to infiltrate Nazi-controlled Scheveningen, a resort town in The Netherlands. The story of how Tazelaar came to be a spy – and how he ended up being assigned to such an unorthodox mission – began a few years before. Tazelaar initially trained to be a midshipman at the Royal Netherlands Naval College in 1938, before the outbreak of the Second World War. 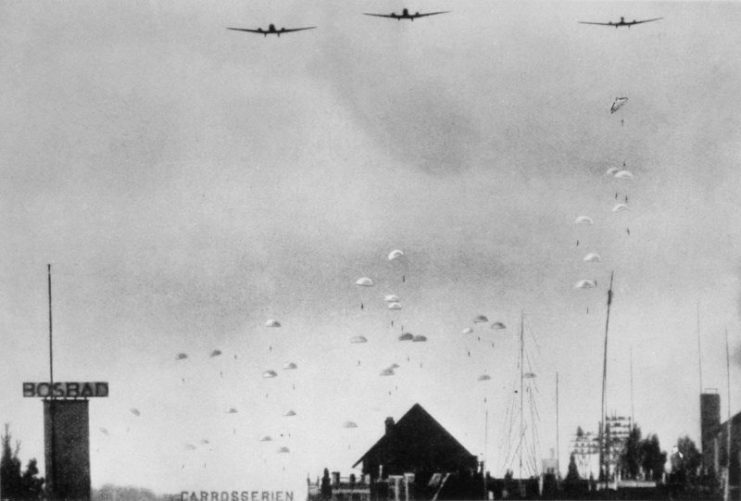 While The Netherlands was officially neutral during the first phase of WW2, they were forced into the war when the Nazis crossed the Dutch border and began their invasion of the country on 10th March 1940. At this time, Tazelaar was working in the Dutch Merchant Navy. He came into contact with a fellow midshipman called John Birnie, who, along with other midshipmen and cadets, had formed an underground resistance organization called Ordedienst. Thus began Tazelaar’s induction into the world of covert resistance, intelligence, and sabotage. The men of Ordedienst realized that they needed outside help to fight the Nazis. To this end, Tazelaar was assigned a mission. 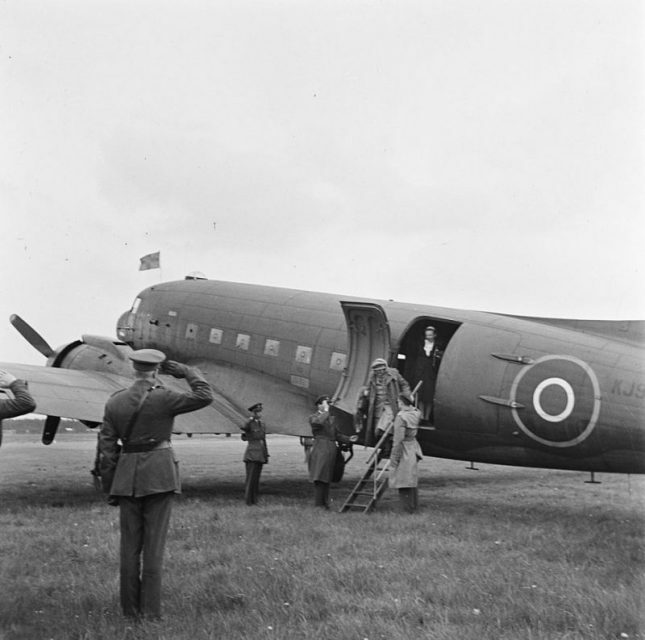 He was to travel to Britain– which, under Nazi occupation, was easier said than done – and make contact with the British Secret Service, which Ordedienst believed would help them. 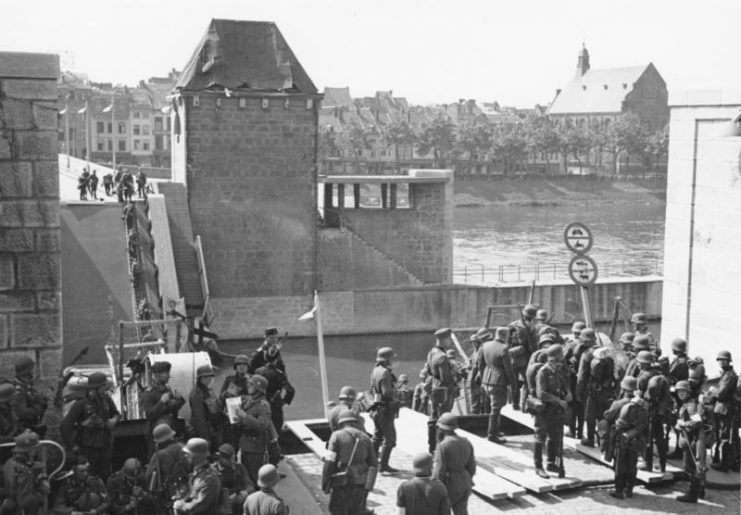 German troops in Maastricht, May 1940. Tazelaar added his name to the muster roll as a stoker on a commercial freighter – a Swiss ship bearing a Panamanian flag as a disguise. Two Dutch resistance fighters also made their escape from The Netherlands on this ship. They would later end up playing a role in Tazelaar’s audacious Contact Holland mission. The ship was heading to New York to pick up a supply of corn for the Germans, but Tazelaar and the other resistance members sneaked off the ship in the Faroe Islands. From there, they made their way to Britain. Once in Britain, Tazelaar and the other resistance fighters (Erik Hazelhoff Roelfzema and Bram van der Stok) made contact with the exiled Dutch Queen Wilhemina in England. After this, van der Stok and Roelfzema worked out a gutsy, if risky, plan to get key resistance fighters into and out of The Netherlands. The plot involved a dinghy, a specially-designed wetsuit, and a bottle of brandy. The first trial to see if this crazy mission could actually work was to be carried out by Peter Tazelaar. Van der Stok and Roelfzema were both very familiar with the seaside town of Scheveningen, at which there was the beachside Palace Hotel that had been taken over by the Nazis and used as their headquarters. The Nazis held officers’ parties – which could get pretty loud and out of hand – at the hotel every Friday night. The plan was for Tazelaar, under cover of darkness, to be taken as close to the shore as possible in a rubber dinghy. He would then swim the rest of the way. Once he was on the beach, he would dispose of his wetsuit (which had been specially designed to be absolutely watertight) under which he would be wearing a high-end tuxedo. He would then pour some brandy over himself and stagger past the guards into the hotel, pretending to be a drunk reveler from the party who had just taken a midnight stroll on the beach. It sounded too crazy to work, but Tazelaar was willing to give it a try anyway. On the night of November 23rd, 1941, he made his way ashore in his special wetsuit. He stripped off once he got onto the beach. As planned, the tuxedo beneath it was bone-dry. 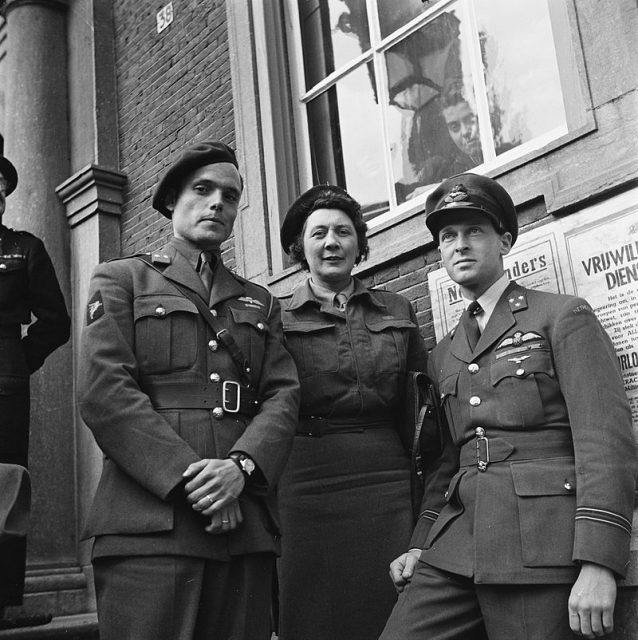 Peter Tazelaar (light coat) and Erik Hazelhoff Roelfzema (opposite him) as adjuncts to Queen Wilhelmina on her return to the continent, 2 May 1945. After splashing some brandy onto himself, he smelled enough like a partygoer to slip by the guards. Against all the odds, he pulled off the first, most audacious part of his mission. The rest of the mission didn’t go as smoothly as they had hoped it would, though. A radio which was parachuted in behind enemy lines for him to use was broken in the drop. Even worse, when it came to extracting the important resistance members from the country, sea conditions proved too dangerous to get them out. The Germans caught wind of the plan. 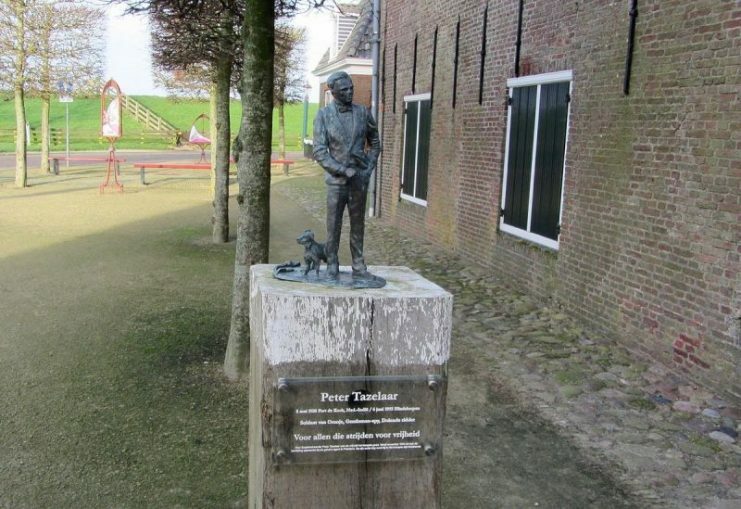 With the Nazis now looking for him, Tazelaar had no choice but to flee The Netherlands. He and another resistance fighter escaped in January 1942, and the James Bond-style beach landing was never again repeated. 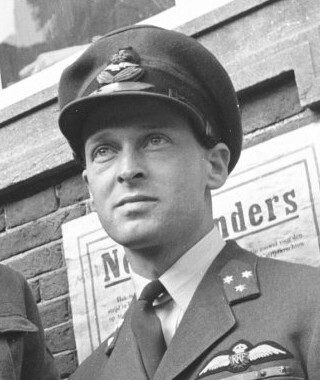 Tazelaar, however, continued to work with both the Dutch Resistance and the British Secret Service. He returned to fight the Nazi occupiers in November 1944, when he and other agents parachuted in to conduct sabotage and espionage missions. He continued to lead a life of adventure after the end of the war, working for the CIA and large multinational corporations among other employers. It seems strange that the opening scene of Goldfinger echoes Tazelaar’s mission with such uncanny accuracy, yet the scene was absent from both Ian Fleming’s novel and the original script of the movie. However, Paul Dehn, a British screenwriter who had been a high-ranking British intelligence officer during WW2, was hired to polish the Goldfinger script. It was he who added the wetsuit scene. Did his knowledge of Tazelaar’s mission some twenty years before the release of Goldfinger inspire him to pen this scene? It is a distinct possibility, but one which remains unconfirmed. Peter Tazelaar, the real-life spy who may have inspired this iconic James Bond scene, passed away in 1993.